The colonial boundaries created by Britain to delimit Uganda grouped together a wide range of ethnic groups with different political systems and cultures. These differences prevented the establishment of a working political community after independence was achieved in 1962. The dictatorial regime of Idi Amin (1971-79) was responsible for the deaths of some 300,000 opponents; guerrilla war and human rights abuses under Milton Obote (1980-85) claimed at least another 100,000 lives. The rule of Yoweri Museveni since 1986 has brought relative stability and economic growth to Uganda. 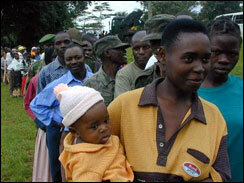 During the 1990s, the government promulgated non-party presidential and legislative elections. Uganda has substantial natural resources, including fertile soils, regular rainfall, and sizable mineral deposits of copper and cobalt. Agriculture is the most important sector of the economy, employing over 80% of the work force. Coffee accounts for the bulk of export revenues. Since 1986, the government - with the support of foreign countries and international agencies - has acted to rehabilitate and stabilize the economy by undertaking currency reform, raising producer prices on export crops, increasing prices of petroleum products, and improving civil service wages. The policy changes are especially aimed at dampening inflation and boosting production and export earnings. During 1990-2001, the economy turned in a solid performance based on continued investment in the rehabilitation of infrastructure, improved incentives for production and exports, reduced inflation, gradually improved domestic security, and the return of exiled Indian-Ugandan entrepreneurs. In 2000, Uganda qualified for enhanced Highly Indebted Poor Countries (HIPC) debt relief worth $1.3 billion and Paris Club debt relief worth $145 million. These amounts combined with the original HIPC debt relief added up to about $2 billion. 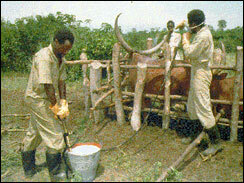 Growth for 2001-02 was solid, despite continued decline in the price of coffee, Uganda's principal export. Growth in 2003-06 reflected an upturn in Uganda's export markets. A history of AIDS, U.S. statistics, health facts and a look at how the epidemic has spread. Major terrorist organizations, the FBI's most wanted and facts and photos from recent attacks.